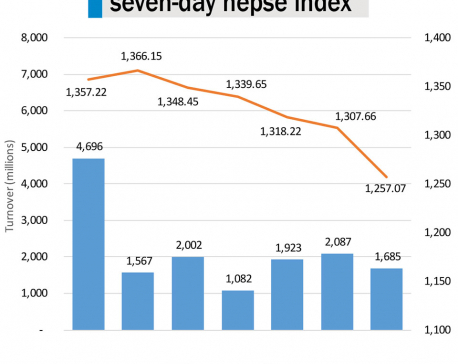 KATHMANDU, Sept 12: Nepal Stock Exchange (Nepse) benchmark index fell 21.06 points, or 1.38 percent, to close at 1,502.2 points, wiping out a market value of Rs 20.97 billion, on Tuesday. The total market capitalization went down. Though the listed companies are offering high dividends due to impressive business performance in the last fiscal year, such announcement from many listed companies on the eve of the festive season has not helped to buoy the investors' confidence. Brokers say that there is a pressure to sell stocks in the market as the investors fear that they are likely to lose money during the bearish trend of the market. "The supply of shares has increased in recent days since there was a huge flow of rights issues and bonus dividends in the last fiscal year," said Gunanidhi Bhusal, managing director at Aryatara Investment and Securities -- a stock brokerage firm. He also said that the selling pressure might also be due to the ongoing rights issues in the market where investors can pick shares at a face-value of the share. Some investors think that the downfall is an impact of the upcoming festive season. “This is not a time for the shares to go down as all macroeconomic indicators are positive and the listed companies are reporting impressive performance. 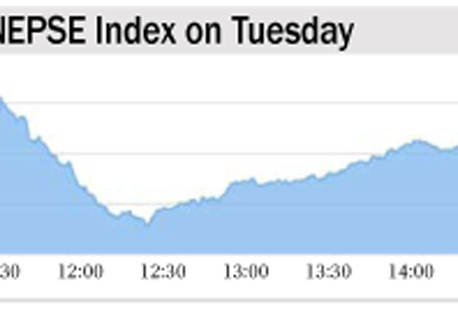 Many investors are off-loading their shares on the eve of Dashain festival to get cash by selling their holdings,” Navaraj Ghimire, a stock analyst, told Republica. “Also, investors having bearish sentiment are selling their shares now so that they can purchase the same stocks at a lower price, driving down the market,” added Ghimire, who is also an active investor in the market. Insurance group suffered the biggest loss of 185.1 points to close at 8,257.84 points. Sub-indices of Hotels and Development Bank groups plunged 42.53 points and 29.82 points, respectively, settling at 2,319.75 points and 1,917.57 points. Banking, the heavyweight group, also ended 18.14 points lower at 1,290.99 points. HydroPower group went down 15.57 points to finish at 1,735.49 points. Finance group shed 14.9 points to close at 753.72 points. 'Others' group, however, went up 2.31 points to settle at 714.66 points. Kamana Sewa Bikas Bank Ltd, Nabil Bank Ltd, Ngadi Group Power Ltd, Arun Finance Ltd, and Prime Life Insurance Company Ltd were the top losers of the day as their share prices fell the most, while the shareholders of United Finance Ltd, Progressive Finance Ltd, Synergy Power Development Ltd, Kailash Bikas Bank Ltd, and Hamro Bikas Bank Ltd were those whose share value went up the most. A total of 1.07 million units of shares worth Rs 569.84 million were traded in the market through 6,458 transactions.